Preset the rich 986 tone found the sound you want to play myself. 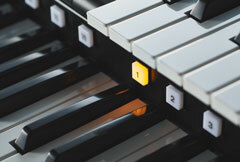 Super Articulation voice also to reproduce fricative of wind of breathing and strings were also installed.Organ has adopted a variety of sounds that can be expressed from the jazzy songs to classical. 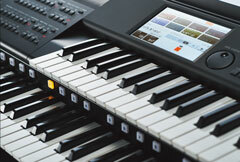 Furthermore, not only the preset sound, you can enjoy to edit the sound to their liking. ※ Super Articulation voice can not be edited. Preset a variety of 634 kinds of rhythm corresponding to the various genres of music. Of course the thing to choose a rhythm with the music, you are free to also edit. Also possible to further your own rhythm from scratch. You can achieve full of personality performance in only the rhythm of their own. ※ There is a pattern that can not be part of the edit. 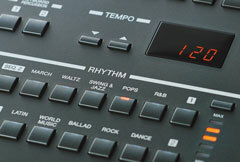 The registration, can be pre-set the tone and rhythm function. By pressing the Registration Memory button you can call in an instant at any time. Instruments to preset a rich menu of 506 types that can be called easy to choose from the music genre, the song you want to play will play immediately. Registration that was created to their liking can be saved to a USB flash memory. 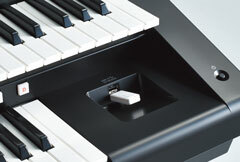 In the strength of the key depression, also the intensity of the sound, initial touch that also changes the tone of expression, after you apply pressure to the keyboard, equipped with sound quality, volume, aftertouch to control the pitch. You can delicate musical expression of a fingertip. By utilizing a pedal that will be controlled by foot, you can express to remain also think bend-up rendition of choking and saxophone guitar. Equipped with easy-to-read 7 inches large-sized liquid crystal panel. Tone and effect, also control the selection of rhythm, edit also, because the intuitive can be made at the touch panel, you can work without stress. As it is playing, you can be saved to a USB flash memory as an audio file (.wav). Listen to playing in the portable music player, or you can share and send to friends. Main unit, pedal unit, stand, speakers, because it is divided into a chair, carry and easy for each unit. Compact folded also included the chair. You can feel free to play anywhere. ELC-02 has function of "ELS-02 Series" which released on April 2014.ELC-02 is a product that has been developed in order to respond to a wider range of performance scenes and needs. STAGEA D-DECK PACKAGE as well as the main unit, pedal, stand, in a structure that can be deconstructed into a speaker, for lightweight, compact, casual model that can carry. We will introduce the main difference in the following chart. If you are owners of STAGEA D-DECK package you can just purchase the main unit only ELCU-M02. 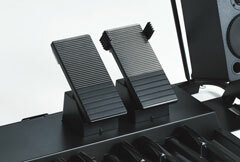 And use your D-deck stand , Pedal unit and stool with ELCU-M02. 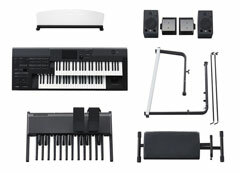 ※ ELC-02 dedicated pedal unit, dedicated speaker, dedicated keyboard stand, only a chair, only the musical score plate is not sold individually. 【ELC】 What is the difference between new product ELC - 02 and ELS - 02 ? ELC - 02 and ELS - 02 have functions that differ in operability, such as the difference in the number of panel buttons and the knee lever operation with the foot pedal, but they have equivalent performance functions. 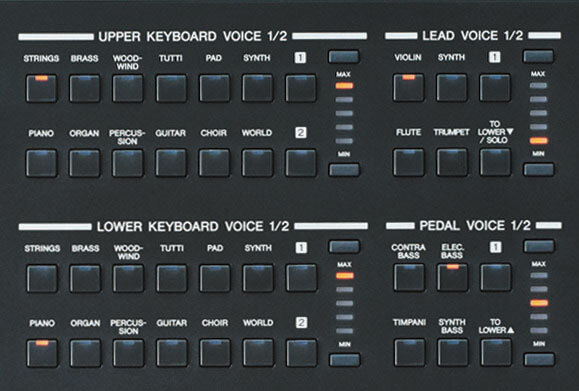 In addition, ELC - 02 is a product considered as a compact and portable casual model, it is a model that you can enjoy as a fully - fledged electone in a wide range of scenes from a performance of an adult 's hobby to concerts and live. 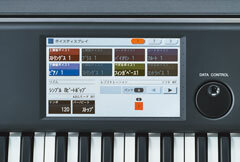 ELS-02 is used in Yamaha music schools and is a "standard" model of Electone STAGEA that anyone can enjoy. Other main specifications are introduced below. * Functions operated with the knee lever of ELS - 02 can be used by preparing optional foot pedals ( FC 4 A , FC 5 ) and assigning functions in ELC - 02.